PIZZA TEEN! 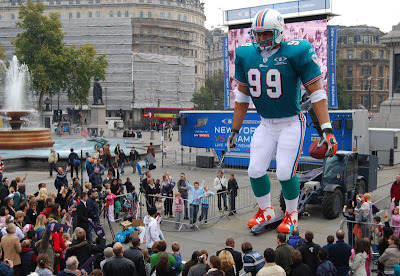 : The Amazing Colossal Man (NFL Edition) Attacks London! The Amazing Colossal Man (NFL Edition) Attacks London! No, that's not a real man in the photo, just an estimate of the average professional football player's proportions in the year 2015 based upon the findings of a recent FDA study investigating skyrocketing levels of roids, electrolytes, industrial toxins and corn syrup in the average American's diet. Okay, that was a lie. 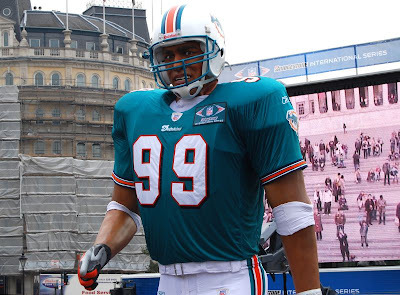 It's just a dumb NFL marketing stunt in Trafalgar Square, London. The NFL hopes to expand American Football to foreign markets. Let's hope they fail hard & fast because, really, haven't we exported enough bad will and stupidity lately? I snagged the photos from Flickr user "normko" who, hopefully, will accept this loving link to his profile as compensation for the use of his images. Why does it look like this giant football player is trying to take a dump? And is there a pooper scooper big enough to clean that up? Probably because he IS trying to take a big dump.